The World Cup Final took place tonight. If I have to tell you that, you must be sick in bed with a duvet over your head or something. Seems everyone on earth was watching this sporting event. It also appears the stands were a celeb heaven. It is said to be one of the most celeb heavy world cups in history and the line up is far too long to recount here. We'll just say for the final we saw the likes of Mick Jagger, David Beckham, Gisele Bundchen, Tom Brady, and Jamie Oliver with Rihanna. 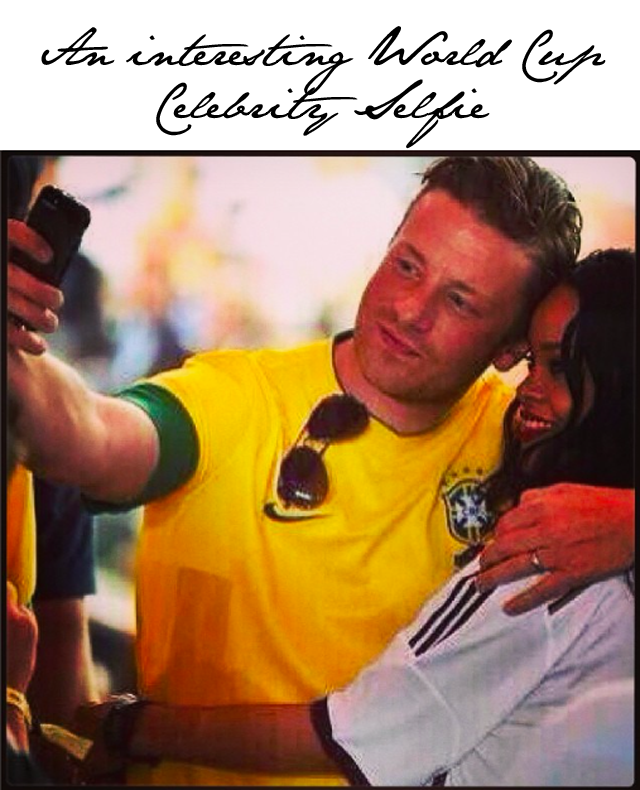 Yes, Jamie Oliver and Rihanna shared a moment at the World Cup. Who knew the two were chums, and yes they do certainly look chummy. Jamie Oliver shared this intimate "selfie" moment on his instagram last night. Suppose they were swapping spaghetti bolognese recipes post picture?